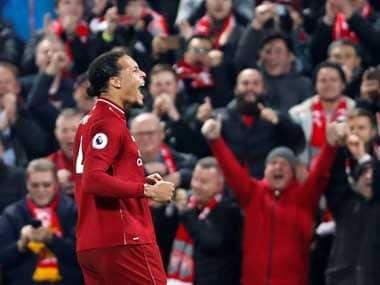 London: As the Premier League title race gathers pace and the fight for top-four places heats up, two of English football's biggest derbies will play a key role in the mounting drama. At the top, leaders Liverpool, one point ahead of Manchester City going into this weekend, make the short journey across Stanley Park to face Merseyside rivals Everton. Third-placed Tottenham, slumping after successive defeats, have to focus on maintaining their top-four berth when Arsenal arrive at Wembley for the north London derby. Georginio Wijnaldum insists Liverpool never lost belief in their ability to blow away opponents after reigniting their title bid ahead of their clash at Everton. Questions were asked about Liverpool's spluttering attack after four draws in five matches, including goalless stalemates with Manchester United and Bayern Munich, with suggestions they were cracking under the pressure of challenging for their first English crown since 1990. 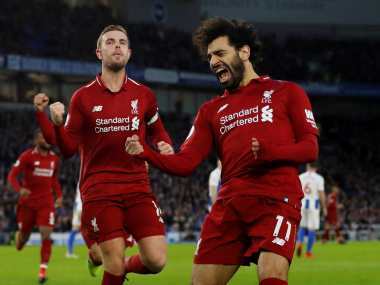 But Jurgen Klopp's side silenced the doubters with their biggest win in almost 12 months as Watford were demolished 5-0 at Anfield on Wednesday. Liverpool remain one point clear of second-placed Manchester City and Reds midfielder Wijnaldum warned their rivals to expect more of the same. "To be fair, I always have that feeling that it will click. The belief is always there. We just have to make sure that it does click," he said. This time last season City were cruising towards a record-breaking Premier League title triumph that sucked all the drama out of the race. But 12 months later, Pep Guardiola's side are locked in a nail-biting sprint to the finish line with Liverpool and the City manager expects plenty more twists and turns before the trophy is lifted in May. 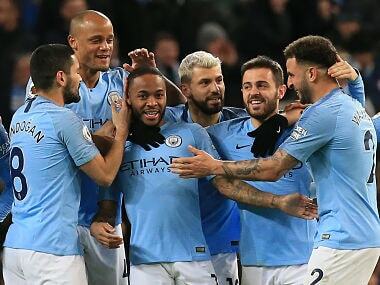 City travel to Bournemouth on Saturday knowing a victory would, temporarily, put them two points clear of Liverpool before the Reds take on Everton the next day. Even a draw would put the champions top on goal difference, but Guardiola, whose team edged to a 1-0 win over West Ham in midweek, won't be surprised if either City or Liverpool surrender points. "We know with 10 games to go, many things are going to happen. I think we are going to drop points, Liverpool are going to drop points. So we are going to see, until the end," he said. Asked to survey the wreckage of Tottenham's faltering title challenge, Mauricio Pochettino refused to condemn his team despite their latest high-stakes flop. Pochettino admits it is "impossible" for Tottenham to win the title after a 2-0 defeat at Chelsea on Wednesday left them nine points behind the leaders. 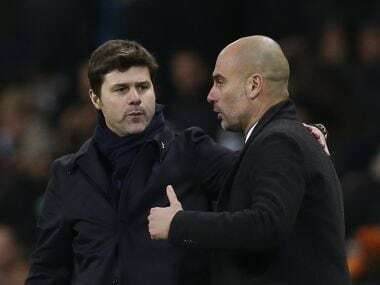 That setback followed hard on the heels of an equally frustrating 2-1 loss at Burnley, but while Pochettino concedes his team have played below their potential of late, the Argentine still believes they can muster an upbeat end to the season. To do so, they desperately need to beat Arsenal, who are only four points behind their hated rivals after thrashing Bournemouth, and then ensure their progress to the Champions League quarter-finals in the last 16, second leg against Borussia Dortmund. "Everyone from the beginning of the season should be satisfied with the possibility of playing against Arsenal at Wembley with the gap at four points. The pressure is on them, not only us," Pochettino said. 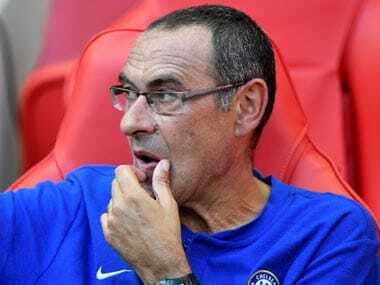 Despite their vital victory over Tottenham, Maurizio Sarri's Chelsea take on west London neighbours Fulham knowing a shock defeat would plunge them back into crisis. Under-fire Sarri's astonishing feud with Kepa Arrizabalaga during the League Cup final loss to Manchester City led the Blues goalkeeper to be dropped for the Tottenham clash. Chelsea responded well to the turbulent few days as they produced one of their best performances of the season to give Sarri some breathing space. The ray of sunshine could be banished if they lose against a Fulham side hoping the appointment of Scott Parker as caretaker replacement for the sacked Claudio Ranieri can spark a last-ditch bid to avoid relegation. Click here to read this week's hottest tips, insights and updates from the world of Fantasy Premier League.